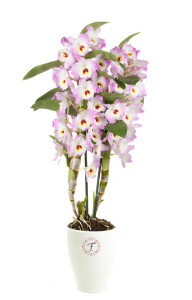 De Hoog Orchids is the absolute specialist in Dendrobium Nobilé. Our range consists entirely of high quality varieties in exclusive colours, and is available all year round. The Apollon is the most versatile Florallure. The stems are totally covered with buds. The flowers are as white as snow and have a soft yellow centre. 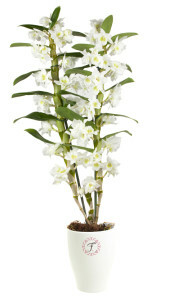 This gives the plant a luxurious and restful look. This magnificently colourful Florallure is a real eyecatcher in your living room. 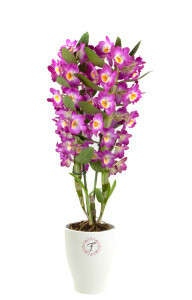 The Akatsuki, with its warm purple flowers each with yellow centres, creates a lovely warm atmosphere. 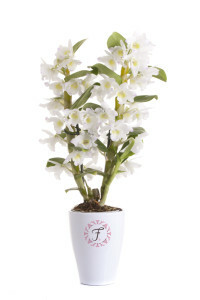 The name of this Florallure says it all: this one brings happiness into your home. 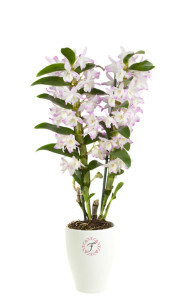 This Dendrobium Nobilé has elegant little white flowers with pretty pink edges. Fresh but still colourful. This Florallure stands out from the other Florallures with its large expressive blooms. This Florallure with its large pink blossoms with their expressively colourful centre is a real eyecatcher in any living room. This rustic Florallure comes in a soft shade of pink with a subtle yellow centre. The many buds that cover the Sea Mary make it a sea of flowers when they are in bloom. It suits a tranquil interior beautifully. 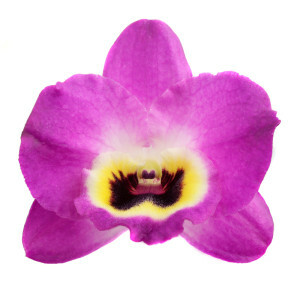 Florallure Red Emperor is an orchid with an exotic touch. The beautiful dark purple flowers are really striking. The dark purple centre makes this flower stand out a mile. The Apollon Midi is the middle of the three available sizes. The plant has the same features as the Apollon but is that little bit smaller, with a pot measuring 9 cm. The Apollon Mini is the smallest of the three available sizes. 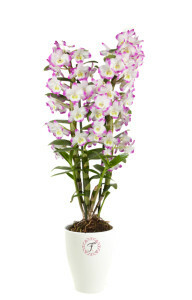 The plant has the same characteristics as the two larger varieties but is the baby of the family with its 6 cm pot. Our range is on offer to the trade via the webshop FloraXchange.nl or may be bought directly. Click on the logo below to go straight to FLorXchange or send an email to: verkoop@dehoogorchids.com to be in direct contact with a member of our sales team.